The attack of giant pythons on unsuspecting people in Indonesia is rising at an alarming pace. 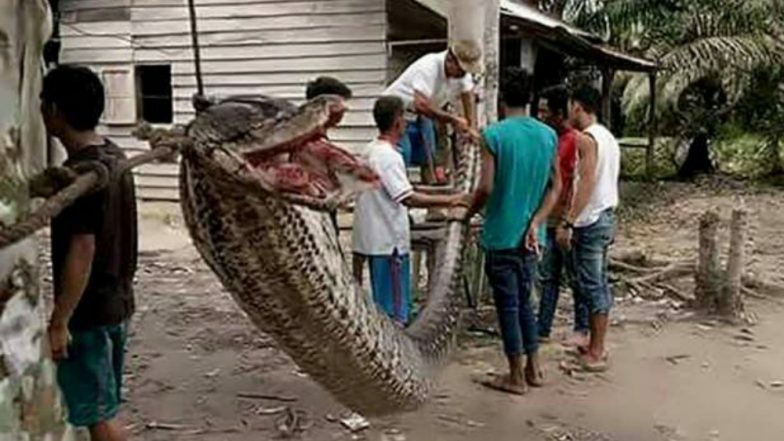 In yet another horrific incident reported from a village in the Southeast Asian nation, a woman was killed and swallowed whole by a reticulated python, considered biggest and strongest in the world. The victim was a 54-year-old woman identified as Wa Tiba who had suddenly gone missing while tending her vegetable garden. Sensing the danger and worst outcome, villagers looked around the spot to find a seven-metre (23 foot) long giant python with a bloated belly. The shocking video contains images of villagers cutting out the slithering snake’s giant belly to find the human body it had swallowed completely! Viewer discretion is advised as the clip has graphic disturbing images. Indonesian villages are getting notoriously infamous for horrifying incidents of giant pythons’ attack on humans. In almost all cases, the predator is a reticulated python (Python reticulatus), a species of python found in Southeast Asia. Now, these reticulated pythons are the world's longest snakes and longest reptiles, and among the three heaviest snakes. Despite being nonvenomous, they are capable of killing an individual simply by coiling around it and constricting it till their hearts stop. The latest incident took place in the village of Persiapan Lawela on the island of Muna, offshore of Sulawesi when victim Wa Tiba vanished without a trace. Around 100 locals carried out a massive search to find her and found the giant serpent lying about 30 metres from Tiba’s sandals and a machete. “Residents were suspicious the snake swallowed the victim, so they killed it, then carried it out of the garden,” said local police chief Hamka. “The snake’s belly was cut open, and the body of the victim was found inside.” They concluded the victim was swallowed head first and her body was found intact. Death of Wa Tiba is not the first case when a human has been attacked and killed by a reticulated python. In 2017, a man was swallowed whole by the giant serpent on the Indonesian island of Sulawesi. According to media reports, the victim was identified as Akbar, a 25-year-old man who had gone missing from Salubiro village and was found after villagers found a misshapen python. Their suspicions proved correct as the human body was found inside its belly. As per snake-lovers and wildlife researchers, these reticulated pythons are believed to pose no danger to human life but blame these frequently occurring incidents on humans’ encroaching the natural habitat of these giant wilds who need wider space to live. Staying in the same region as that of a big python is never advised as these natural constrictors when coming in contact with humans will exhibit their natural behaviour.